Dante Tinga, Jr. is Senior Vice President and Head of Research for BDO Unibank. Dante has 20 years of experience in the financial services industry mostly as a research analyst. Prior to joining BDO, he was Head of Research for the Philippine Equity Partners-Bank of America Merrill Lynch joint venture. 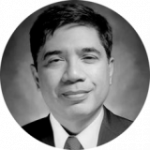 In his career, Dante also served stints as Head of Research at Credit Suisse and Head of Investment Banking and Special Assets with The Land Bank of the Philippines. He has a BA from the University of the Philippines and an MBA from the University of Pennsylvania’s Wharton School.